Originally published by George Allen and Unwin in 1962 (2nd ed. 1990) and by Houghton Mifflin in 1963 (2nd Amer. ed 1991);The adventures of Tom Bombadil was also published in The Tolkien Reader, Farmer Giles of Ham and The Adventures of Tom Bombadil, Poems and Stories and poems in this book are often used in anthologies. With the resurgence of interest in J. R. R. Tolkien's work spurred by the release of the film version of The Lord of the Rings by Peter Jackson, and because the enigmatic Tom Bombadil was kept controversially out of the film, it seems only fitting to draw attention to an oft-neglected but delightful book of his adventures. Tolkien has been known to write myth in the old-fashioned way, to explain or enlarge upon aspects of the world. The posthumously-published Roverandom (1998, Harper Collins, Houghton Mifflin), for example, is a tale explaining what happened to son Michael's favorite toy - a little metal dog lost on a beach in 1925. Michael and the toy had been inseparable. The family searched for two days but it was never found. Tolkien comforted Michael by telling the story of how Rover(andom) was a real dog turned into a toy by a wizard, and then carried to the moon by a seagull. Likewise, Tom Bombadil was originally a Dutch doll also belonging to Michael Tolkien. John, his brother, put the doll down a lavatory. 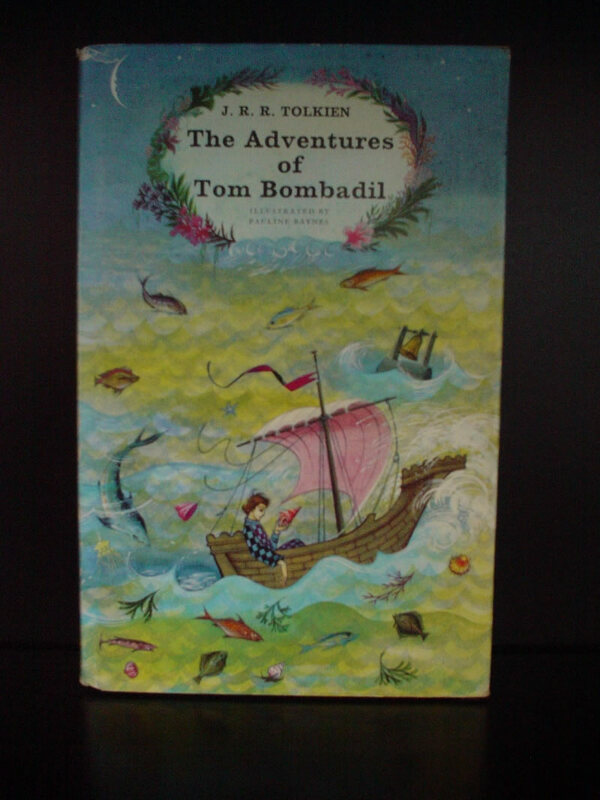 Bombadil was rescued and Tolkien wrote The Adventures of Tom Bombadil, originally published in Oxford Magazine in 1934. Tolkien later offered to his publishers the idea that Bombadil's story could be expanded into a sequel to The Hobbit, but they didn't bite, so Tom appeared anyway in The Lord of the Rings. Tom makes his debut in the form found in this collection. The author's method reminds me of the ways in which painful losses are explained in many other cultures. Examples include some Native American mythologies explaining the disappearance of American bison, and German legends about the disappearance of magical creatures from the world. Tolkien's explanation also seems similar to stories told about the rise of iron and technology and the passing away of old traditions, or of the disappearance of the unicorn (it missed the ark), and the rise of the dichotomy that rends myth from objective "reality." One can see the theme at work in the poem "The Last Ship," present in this collection, and in Tolkien's later writing - elves sailing out of Middle Earth forever, making way for the age of men. Bombadil's Adventures, however, is a heroic comedy in part about his capacity to escape disappearance - to endure. One kind of disappearance is that of loneliness, where one fades from the view of others, becomes "mythical," alien, other - larger than life and yet too small to see, casting no shadow. It is the solitude of being attached to other worlds, worlds where story is more than pastime, worlds where real objects have more than one kind of life and significance, and the loneliness of being unable to weave the other worlds and this one seamlessly together, to make everyone understand. Tolkien more than once confessed the mythic importance of the Bombadil that grew from a child's doll into a profound mystery under his pen. He referred to Bombadil in two ways. On the one hand, he has called Bombadil both the spirit of the dwindling English countryside and the spirit of natural science: "the spirit that desires knowledge of other things, their history and nature, because they are 'other'"(letter #153). On the other hand, he has suggested that the reason he couldn't bring himself to keep Bombadil out of The Lord of the Rings is that he represents something larger, something best not left out, though he hesitated to look too closely at what that was. One can surmise that this is true both of Tom as he appears in the Ring saga and also as he appears in the Adventures. The Adventures consists of 16 poems, three of which are about Tom Bombadil, one about a hobbit and a troll, two about the Man in the Moon, six which I will call simply "adventures," and four which are in the nature of a bestiary. There is a wealth of good storytelling and mythmaking here. For those who love The Lord of the Rings, there are hobbits in the Shire, elves sailing west, and enough familiar places to give one the feel of Middle Earth as the setting. Given both the brevity and diversity of some of the poems, a brief survey may be in order, with extended comments following. The first poem, from which the book takes its title, is a tale of Bombadil's mastery of his realm. It is a treatment of a particular kind of paradox. Bombadil is master, not owner, and so he both lives in peace with the creatures of the wood and also escapes harm or subjection to them. "He is, as you have seen him," ... "He is the Master of the wood, water, and hill." "Then all this strange land belongs to him?" "No indeed!" she answered, and her smile faded. "That would indeed be a burden," she added in a low voice, as if to herself. "The trees and the grasses and all things growing or living in the land belong each to themselves. Tom Bombadil is the Master. No one has ever caught old Tom walking in the forest, wading in the water, leaping on the hill-tops under light and shadow. He has no fear. Tom Bombadil is master." It is this distinction - master, not owner - that is captured by the title poem. Tom is grabbed by the beautiful river maiden Goldberry, trapped by Old Man Willow, captured by the Badger folk, and haunted by a Barrow-Wight. In each dilemma he has only to indicate his wish to be free and they quickly recognize their master. The river maiden, however, Tom does not forget so easily, and that is the rest of the tale. "Bombadil Goes Boating" tells of Tom's journey to visit a hobbit friend in the Shire. The way that Tom and the animals of water and air tease each other made me laugh all through it, but the hobbits in their jests were quite over the top. Readers of The Hobbit and The Lord of the Rings will hear strains of "The Road Goes Ever On and On" in "Errantry," the story of a mariner unable to escape the pull of journeying and adventuring. The warlike journeying of the mariner stands in contrast to the peaceful wandering of Tom. "Princess Mee," a fairy, finds her doppelgangers in a very strange place. "The Man in the Moon Stayed Up Too Late" tells what happens when the Man stays out drinking far too late. In "The Man in the Moon Came Down Too Soon," the Man grows bored with his majesty and lonely in his luminescent kingdom and decides to visit the world below. He gets less than he bargained for. "The Stone Troll" is discovered by Tom Bombadil gnawing the bone of Tom's "nuncle." Ordinarily master of his domain, Tom find that it's not so easy to make a troll surrender his supper. The Lonely Troll in "Perry-the-Winkle" decides to visit the Shire and 'meet new people,' but the reception is hardly a warm one. Only Perry the Winkle finds himself sampling the excellent pastry from the troll's kitchen. This reminds me of the recent film Shrek and also of the old fable The Little Red Hen. "The Mewlips" is simply creepy. In the dark and slime on the spooky side of the Merlock Mountains one finds some nasty things, but the maker of this poem would be one of the few who's returned to tell of them. "Oliphaunt" is another bestiary poem about a creature one either will not believe or will not forget. "Fastitocalon" is deliciously monstrous, a sea monster tale of Middle Earth. "Cat" tells of a feline who dreams of the untamed ages in the wild. Tolkien makes one really feel the places we go in stories through the dreaming of catty exploits. "The Shadow-Bride" finds a mate in a man who casts no shadow. "The Hoard" is a moral tale brilliantly tracing the corruption wrought by riches through successive changes of ownership. In "The Sea-Bell" one world contains a doorway to another, a small world within a shell. Adventuring between them shows a traveler how large a small amount of imagination can be, and leaves him alone even among others. "The Last Ship" is bearing elves past the western havens and out of Middle Earth. The ship is not full. It can carry one more. And the elves call along the river banks to Firiel, an "Earth maiden elven fair." The story is a tearing, as Firiel stands between this world and the world of elves calling her home with them. The theme of loneliness through appearing monstrous or alien to the world is prevalent in this collection. Tom's loneliness is evident in "Bombadil Goes Boating," and his status as something wholly other is evident by the arrows he receives in his hat - which he prefers to consider the hobbits' way of teasing him as the merry animals do. The Man in the Moon too is lonely for all his wealth and importance, but finds the world below strange and unwelcoming. In it, he is not only unimportant, but is cheated, as proof of this. "The Hoard" tells of the loneliness and isolation of greed. The suitor of "The Shadow-Bride" is clearly not only alone but also detached inwardly, just as Tom is, because he casts no shadow. In "The Sea-Bell" one can feel palpably how a traumatic experience can set one apart, can alienate. This is evident in the final words " ... in sad lane, in blind alley, and in long street ragged I walk. To myself I talk; for still they speak not, men that meet." This theme appears again in "The Last Ship" - imagine being called away by elves, by a world beyond this one, but finding one's feet sunk in mud. It is the feeling of belonging to 'another people' and perhaps never really being able to communicate the reasons one feels drawn away, seeming to prefer loneliness when one is actually longing to follow one's heart out of the world precisely in order to find one's people. Even the bestiary poems are lonely. Only in the title poem does Tom find Goldberry and in "Perry-the-Winkle" does the Lonely Troll find Perry. In Tom's Adventures and in The Shadow-Bride the suitors actually seize their wives. This would be disturbing but for the larger context; sometimes one must go to extraordinary lengths even to communicate one's existence and one's desire for friendship and community; one must walk into another person and not look back. And the poems seem to be saying, as in "Bombadil Goes Boating" and "Perry-the-Winkle," that one must take responsibility for the journey. The Lonely Troll sits alone on stone, the cold petrification of unwanted solitude, but no one sees or comes near. He must venture out, must reach out to another person, must be vulnerable, as Tom was to the arrows, as Firiel was to the mud, and even then (as Tolkien once said of "hope" in his worlds) there are no guarantees. If only Tom had a boat license, all would be fine. All of the poems are wonderful, but of course it is Bombadil around whose tale the volume is designed. Tom is an enigma as much as a hero. The most difficult thing to get over for some friends of mine is Bombadil's trademark singing: "Come, derry-dol, merry-dol, my darling!" which can seem like nonsense. In fact, in The Lord of the Rings, Frodo thinks of it as exactly that. This, and his detachment from the power struggle that is the tale of the ring, are perhaps the primary reasons why Bombadil is sometimes marginalized or ignored among Tolkien's creations. They are, in fact, the same issue. If one looks closely, there is sense to the nonsense. Middle Earth is a musical world and Tolkien, as a friend points out, was a linguist who confessed to having begun writing the stories as a way of experimenting with his invented languages. Bombadil, in the Tolkien mythos, laid aside the broader scope of the world, put it in a corner, not to "fight" - no longer to tread where he might find himself participating in the question of power, including, in the other books, the war of the ring. Indeed, that is why he is master but not owner of anything. In a world of song Tolkien seizes Bombadil's singing as one strong way to indicate his detachment. If I may venture to read into Old Tom's life a little, he has decided not to go where being involved in struggle, on one side or another, of some kind or another, would be inevitable, and perhaps the only moral option. He has turned aside, decided to make peace, to make it daily like bread, to make it in his own presence, with the things and the companions that do not make war, and he has decided to expand that peace to a limit he can manage without being drawn into the black smoke beyond. The semi-glossalalia of Bombadil indicates a carefree inner detachment from the world, from vested interest, from struggle - a mode so carefree that it needn't even worry about the coherence of words. This explains the source of his power, his apparent deviance from the norm, and the necessity of not leaving him out of the larger Story. It is that which Tolkien "needed to say that was not elsewhere said," if I may fill in the "feeling" he was admittedly "not prepared to analyze." And I for one love Tom Bombadil for this. So I too will sing his songs. The language sounds like gibberish, perhaps. But it is speaking volumes. Bombadil's nonsense singing is not any stranger that the beebop of popular music or the "tra-la-la" of a children's skipping song (and Tom is both older and younger than everyone else in the tale). Here we have the kind of pleasant folk-glossalalia that one might find among a particularly musical people when walking or working. Similarly, recall the good-natured songs A.A. Milne would give Pooh and Piglet: "tiddle-um-tumm.... tiddle-um-tum" as they strolled through the Hundred Acre Wood. Being with Bombadil is like being in his song. Tom is an immense solitude, though not entirely alone, and he is at peace. He is the culminating principle of the theme of this collection. The book, in its original form, is now quite scarce. One can find used out-of-print and rare editions in various places online: try Abebooks. It is also conveniently available as part of the collection entitled The Tolkien Reader, which contains the complete books The Adventures of Tom Bombadil, Tree and Leaf (including Tolkien's essay "On Fairy Stories" and his autobiographical fiction "Leaf by Niggle"), and Farmer Giles of Ham, as well as a short dramatic piece by Tolkien, "The Homecoming of Beorhtnoth Beorhthelm's Son," which is based on the classic The Battle of Malden, and also adds as the introduction Peter Beagle's essay "Tolkien's Magic Ring." Finally, for anyone looking for essays on the character of Tom Bombadil and his place in Tolkien's milieu of Middle Earth, the following links are good places to start: "Who is Tom Bombadil?" An essay by Gene Hargrove is here. What is Tom Bombadil? Thoughts and Discussion by Steuard Jensen can be found here.